What separates the traditional enterprise from the likes of Amazon, Netflix, and Etsy? Those companies have refined the art of cloud native development to maintain their competitive edge and stay well ahead of the competition. 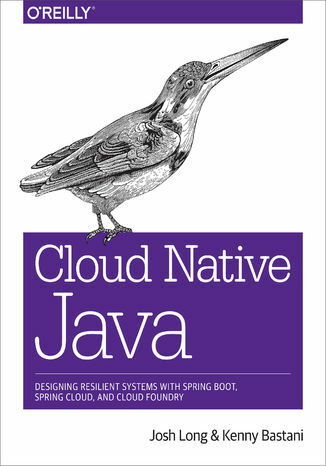 This practical guide shows Java/JVM developers how to build better software, faster, using Spring Boot, Spring Cloud, and Cloud Foundry.Many organizations h ave already waded into cloud computing, test-driven development, microservices, and continuous integration and delivery. Authors Josh Long and Kenny Bastani fully immerse you in the tools and methodologies that will help you transform your legacy application into one that is genuinely cloud native.In four sections, this book takes you through:The Basics: learn the motivations behind cloud native thinking; configure and test a Spring Boot application; and move your legacy application to the cloudWeb Services: build HTTP and RESTful services with Spring; route requests in your distributed system; and build edge services closer to the dataData Integration: manage your data with Spring Data, and integrate distributed services with Spring...s support for event-driven, messaging-centric architecturesProduction: make your system observable; use service brokers to connect stateful services; and understand the big ideas behind continuous delivery Ebook porusza temat Native. Jedną z istotnych spraw poruszanych w ebooki jest: Designing. Jeśli interesuje Cię: Resilient, to ebook dla Ciebie. Dużo wiedzy na temat: Systems w formacie EPUB, MOBI i PDF. Hasło przewodnie tego ebooka to Spring. Jeśli szukasz ebooków o: Spring, to jest pozycja dla Ciebie. Dogłębna wiedza na temat Foundry. ISBN 9781449374594. Porównywarka cen ebooków, które dostępne są w formatach PDF, MOBI i innych. Na urządzenia Kindle i inne. Tutaj znajdziesz ebook, którego szukasz. Nie wszystkie ebooki w ofercie są darmowe. Wspierajmy autorów i kupujmy ebooki.